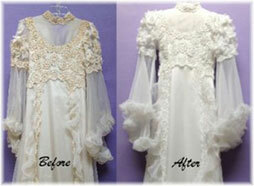 Let us give your yellowed wedding dress premium wedding gown restoration to restore it to a beautiful off white color. Our wedding dress restoration experts will remove yellowing and oxidation spots. You will enjoy the peace of mind knowing your vintage wedding dress will receive our tender loving care. Our Heritage Couture™ wedding gown restoration includes all shipping costs and a shipping kit as well. You can choose to also have your wedding gown preserved with either our Museum Method™ or Heritage Box™ preservation. Hand cleaned or dry-cleaned in virgin solvent. *Accessories include veils, shawls, gloves, bolero jackets, slips, jewelery, and headpieces. Shoe cleaning and preservation additional charge.We will send your shipping kit and instructions via FedEx Monday through Friday. Local customers call 866-268-4696 to schedule gown drop off.